Ever wondered what it would feel like to step inside a computer? Apparently not as different to the 1982 movie Tron as you might expect! 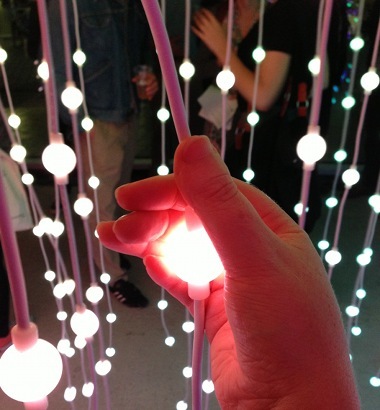 Last night saw UK premiere of an immersive art exhibition in Bristol, named Submergence and exploring this idea in the form of hundreds of light bubbles. Like an extravagant bead curtain, the lights glimmer on and off in varying patterns and colours. It’s a bit like strolling through an aquarium where the water is breathable – fairly magical, especially if you visit after nightfall when the lights gain a shimmering intensity offset by the darkness outside. 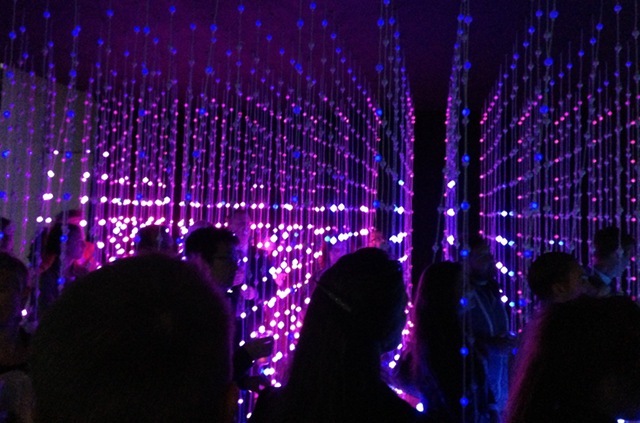 Created by award-winning digital artists Squidsoup, Submergence was designed and developed in the UK and Norway, and has already been shown at the Geneva Mapping Festival and in Oslo. The installation at The Eye building, just over the footbridge from Creative Common, behind Bristol Temple Meads train station, is the only UK showing. 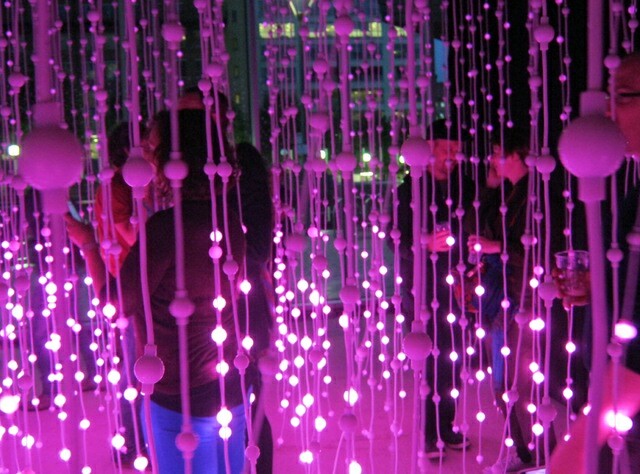 It’s been brought to Bristol thanks to Squidsoup’s residency within Watershed’s Pervasive Media Studio. Watershed describe it as “a virtual world, where pixels on a screen are replaced by thousands of points of light floating in space”, it’s a truly remarkable experience, and well worth strolling down to Bristol Temple Quarter for. Submergence is free to visit and is open to the public from six days a week (it’s closed on Mondays) at the following times: Tue–Fri 12.00 – 14.00 & 17.00 – 21.00, Sat & Sun 12.00 – 21.00, until Saturday October 12th, when it flits over to St Petersburg. Find out more.